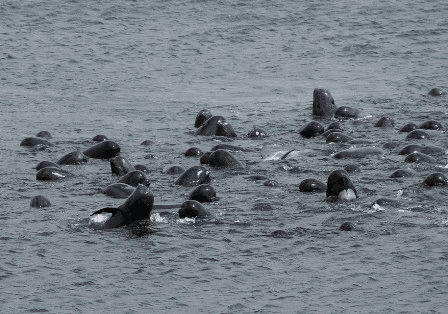 Concerns are growing regarding a potential mass stranding by a pod to 100 pilot whales off South Uist in the Western Isles. British marine wildlife bodies are on the scene monitoring the whales. According to reports the the pod was first sighted in Loch Carnan on the afternoon of Thursday 19 May. About 20 of the animals are reported to have head injuries, leading to speculation about possible boat collisions or whales attempting to strand themselves on the rocky shores of the sea loch. The Irish Whale and Dolphin Group (IWDG) has issued a stranding alert on its website, citing the fact that a similar near-stranding event in the same Scottish loch last October preceded the mass stranding of 33 pilot whales (possibly members of the same group) on Rutland Island off Co. Donegal. The BBC website has some striking photos of the distressed whale pod showing the extent of some of these head injuries. Experts say that the pod is very vocal, and suggest this could be a sign that the animals are distressed. Members of the British Divers Marine Life Rescue (BDMLR) are concerned that the whales will try to beach themselves. "Rather than try to stop them coming ashore, we would let them come ashore and then try to deal with situation when it arose,” explained BDMLR’s Scottish organiser Alasdair Jack. "We have got several sets of pontoons with us, which is our whale refloatation equipment, and we have got more on the way. We have currently got 12 sets congregating on the Uists, which is basically every set in the UK." Calum Watt, a senior inspector with animal welfare charity Scottish SPCA, said that they “remain hopeful” the animals will not strand, but expressed concern that the injured animals may try to come ashore, and that the healthy animals would follow them in.